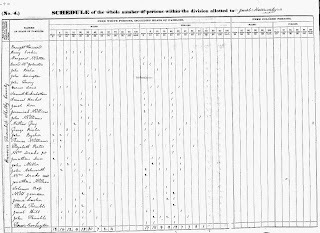 Jacob Kern, line 11 of the Shelby Co., IN 1840 census, was born 4 Jul 1779 in VA and died 1843 in Shelby Co., IN. You can see a typed version of this census record here. He was 61 years old at the time of this census. He married Sarah Ryan (1780-1818), and they had at least seven children. According to this census, there was one male under age 5 (b. 1835-1840), one male age 5-10 (b. 1830-1835), two males age 20-30 (b. 1810-1820), one male age 30-40 (b. 1800-1810), one male age 60-70 (b. 1770-1780), one female under age 5 (b. 1835-1840), one male age 5-10 (b. 1830-1835), and one female age 20-30 (b. 1810-1820). Jacob's wife, Sarah, had died by this time, so some of these were probably grand children or other relatives. Their son, Isaac Kern was born 29 Nov 1806 in Shenandoah Co., Va. and died 20 Aug 1893 in Scott Co., Va. Isaac Kern married (1) Mary Catherine Houseman and (2) Elizabeth Good. Isaac was living in Virginia at the time of this census.